Five little friends in the tallest tree. Here is Owl. Where’s her family? 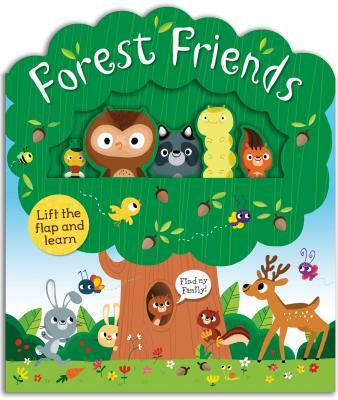 Forest Friends is a tree-shaped board book with five cute woodland animals on tabs. Inside, there is lots of lift-and-learn fun, with big gatefold flaps to open out and discover the animals that live at the top of the tree, in the leaves, and down to the branches, the trunk and the roots. The attractive cover and quirky, retro-style illustrations should have real pick-up appeal for young children, and the rhyming text and cute characters make it enjoyable for parents to read out loud. Children will also learn a little about each animal, where they live, and their family group.